Description of "Traditional Folk Songs of Malwa"
This book is written in Hindi and in English. The 75 songs are presented in both Hindi and transliterated Roman script, in order that they may be appreciated by Hindi and English-speaking readers. Also, the explanations for the songs are written in Hindi and in English. 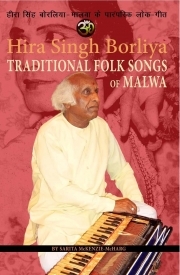 Pandit Hira Singh Borliya is an acclaimed folk singer who was born in June 1934 at Ujjain, Madhya Pradesh, India. Borliyaji has devoted his whole life to music, and for the last 60 years has been collecting, performing and teaching folk songs of the region—especially the Kabeer and Malwa traditions. This book containing 75 songs was an idea first discussed by Hira Singh and his daughter, Sarita, in August 2003. It contains the artist's 70 favourite traditional songs for Mata Pujan, Ganesh Pujan, Lord Ram, Lord Krishna, Gorakhnath, Matsyendranath, Bharthari, plus marriage and dance songs. It also includes five songs of the famous mystic poet Kabeer. Through publication of this book, the dream of father and daughter to see these songs preserved for posterity is finally realised. A recently appointed All India Radio artist, Sarita has performed as a singer and sitarist both in India and abroad, and enjoys the benefit of vast musical experience with western and Indian musicians. She performed with Monash University World Music Orchestra at the 2007 International Jazz Festival in Melbourne, Australia; and more recently, in Nepal, with visiting American jazz musicians at the Kathmandu Jazz Conservatory in May 2009. Sarita is currently researching her doctorate in music at Vikram University, Ujjain, on the subject of Ustad (Baba) Allauddin Khan; and her study of Indian classical sitar continues under the guidance of "India's First Lady of Sitar", Srimati Joyas Biswas of Kolkata. She is also furthering her study of Indian classical vocals and folk singing under the guidance of Pandit Ramakant Dubey of Ujjain and her father, Pandit Hira Singh Borliya, respectively. Doctor of Music – Vikram University, Ujjain, India. Reviews of "Traditional Folk Songs of Malwa"
I am confident that the authorities and scholars who examine this publication will dive deep into its contents and will ultimately find themselves immersed in the realm of folk emotions. I must wholeheartedly thank all those who contributed to this worthy endeavour with an expectation of many more such works to be forthcoming in the future.